After such a long month waiting, the wait is finally over! 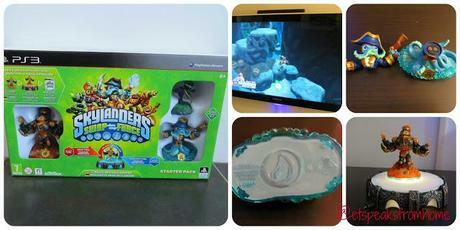 Skylanders Swap Force has landed and we have the starter pack for review. The excitement of both of my children plus Mr C was palpable! Mr K had played with them in Argos Christmas July and he had been pestering me since!This starter pack comes with 3 Skylanders figures, 1 Portal of Power, 1 Character Poster, 3 Sticker Sheets with Secret Codes, 3 Trading Cards and of course the video game.The new Skylanders game builds on the incredibly popular previous releases, and lets kids reconfigure 16 all-new SWAP Force characters into more than 250 unique figures by swapping the top and bottom halves. Mixing and matching enables players to mix up special abilities and weapons to take on the new adventure, plus, all previous characters from the previous games will work too! There’s also a tonne of new abilities, including flying, climbing, digging, bouncing and teleporting.Blast Zone, Wash Buckler and Ninja Stealth Elf are the included figures and the first two are swappable but Ninja Stealth Elf is not. The Portal of Power plugs into the normal USB port and works really well - it is able to detect instantly that the figures/bodies have been swapped. Ms C has not mastered the controls of the game but she loves to play with and swap the characters!In the game, you control your chosen character and walk through the story in much the same vein as the previous instalments, completing various missions, challenges and battles along the way. Mr K had played the previous version at his friends' houses and was able to pick up the controls to this version without any problems. We are only about 10% through the story mode at the moment and we're very impressed with the level of detail to the story and the depth of the game. The game can be played with one player or two players. If you wish to play two players, simply turn on the second controller and press x to join in, then place the additional character on the Portal of Power. Note, the two characters on the portal of power must be whole. For example, if someone has Blast Buckler (body from Blast Zone and legs from Wash Buckler), the other player couldn't use the same legs for Wash Buckler. From this starter set, the other player would have to use Wash Zone (body from Wash Buckler and legs from Blast Buckler) or Ninja Stealth Elf.This is definitely going to be a popular Christmas present as the game has a lot of variety with the many SWAP force character combinations you can make and the game itself is fun, challenging and very enjoyable. For more information, please check out their Facebook page, Twitter and YouTube. Disclosure: We have received the product to do an honest review.